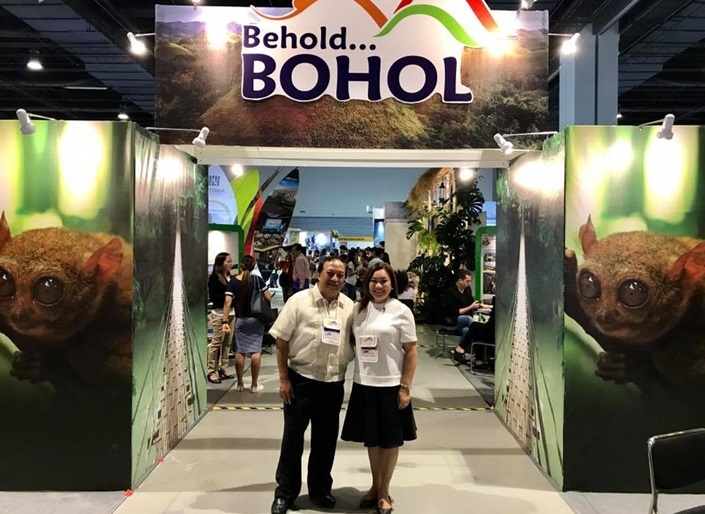 The province of Bohol shone through as it became one of the most popular booths at the 28th Philippine Travel Mart at the SMX Convention Center, Mall of Asia, Pasay City on September 1-3, 2017. This year, 26 exhibitors from Bohol joined the biggest travel trade exhibition in the promotion and marketing of domestic and inbound tourism and Gov. Edgar Chatto personally led all the Boholano participants in the three-day marketing activities aimed to further promote Bohol as a tourist destination. The Bohol Pavilion was branded with the “Behold Bohol” tagline at the entrance wherein most visitors were domestic including students and travel agents. The Bohol Tourism Office(BTO) staff were present at the event to provide assistance and support to Bohol. The exhibitors from Bohol include the Bohol Federation of Travel and Tour Operators (BOFETTO), Ramyer Travel & Tours, Belian Hotel, Boffo Resort, Bohol Tarsier Permitees Corp., Phil Fun Divers & Lost Horizon, Bohol Sunside Resort, Loboc River Resort, Amarela, Linaw Beach Resort & Oasis, Alona Tropical Beach Resort, Eskaya Beach Resort & Spa, Mithi resort & Spa, Kew Hotel, Flushing Meadows, Bee Farm, Kayak Asia, Chocolate Hills Adventure Park (CHAP) and the LGUs of Anda, Tagbilaran City, Danao, Panglao, Loboc, and Antequera. Overall, the participants from Bohol were able to generate a grand total worth P1,948,791.00 of sales. Bohol Bee Farm acquired the largest sales which amounted to P1,031,660.00 followed by Eskaya Resort with sales worth P384,340.00.